In 5-quart Dutch oven, melt butter over medium-high heat. Add onions, Italian seasoning, salt and pepper flakes. Cook 4 to 6 minutes, stirring frequently, until onions begin to brown on edges. Stir in broth and whipping cream; heat to boiling over high heat. 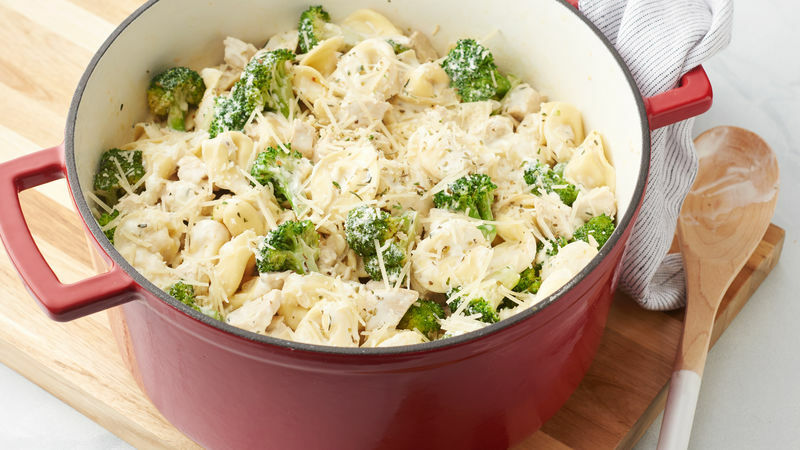 Stir in tortellini, chicken and broccoli; return to boiling. Reduce heat; simmer uncovered 5 to 7 minutes, stirring frequently, until tortellini is cooked and broccoli is tender. Remove from heat; stir in cream cheese until melted. Let stand 5 minutes; stir. Top with Parmesan cheese. Halve broccoli florets if large. Can’t find the 10-oz bag of fresh broccoli florets? No problem. You can usually get the 4 cups of florets from 1 large head of broccoli.